Sir Philip Green's retail empire has reported a 42% drop in profits for its last financial year, before pressure on high street retailers gathered momentum. 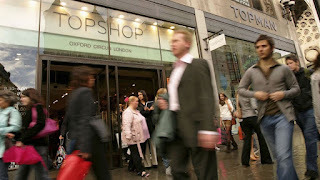 Taveta Investments, home to the Arcadia group of brands including Topshop, Dorothy Perkins, and Burton, said it made operating profits before goodwill, amortisation and exceptional items of £124.1m in the year to 26 August 2017. Total sales fell 5.6% on the previous 12 months to just over £1.9bn. The group, which is not listed on the stock market and therefore not obliged to file reports on its progress quarterly, once included BHS in its stable but for its controversial sale in 2015 for £1. The chain's collapse a year later, amid stinging criticism from MPs, prompted Sir Philip to contribute £363m of his own money to help plug pension scheme shortfalls. Taveta's chairman of 15 years has since left to be replaced by Baroness Karren Brady, the chief executive of West Ham United and assistant to Lord Sugar in TV's The Apprentice. Commenting on the past year on behalf of the board, Taveta's chief executive Ian Grabiner pointed to a "challenging time" for retail generally despite encouraging digital sales progress. He said: "The retail environment remains highly competitive and challenging. "Our worldwide digital sales were +11.5% v last year. The increase in digital sales is taking place at the expense of traditional 'bricks and mortar' retailing, as consumers embrace the opportunity to purchase across all the channels available to them. "Whilst we have found headline sales and profits disappointing, we remain a strongly cash generative business and had a positive net cash balance at the year end of £157.2m." He confirmed Taveta was on track to deliver a new distribution centre in Daventry next year, promised "significant" development to its digital selling platform and signalled job cuts were unlikely despite the tougher times for the high street. "We look to be as efficient as we can be given the challenging retail environment," he said.